Posters have been unveiled for the new KBS Wednesday-Thursday drama “Jeon Woochi” ahead of its debut on Nov. 21. 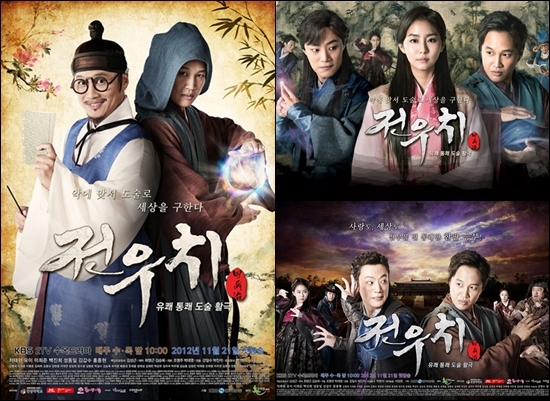 The two poster designs portray the charming features of the main cast members Cha Tae-hyun, Uee, Lee Hee-joon, Baik Jin-hee, Song Dong-il and Hong Jong-hyeon. In one poster, Cha Tae-hyun displays his two characters showing his charm and capabilities in reversal: One is Ichi, who wears horn-rimmed glasses, holding a book in one hand and a pen in the other hand and smiling naively, and the other is dignified and charismatic Jeon Woochi. The other poster features unique characters of the six actors. In the second poster, Cha and other five main cast members show their differing personalities. Cha and Lee Hee-joon in the center are exchanging cold stares with each other, Uee is presenting haughty and cold personality with her long hair befitting an image of ‘ice princess’, and Baik Jin-hee makes cute expression, wearing her hair bound high. Song Dong-il demonstrates his ‘real look’ as character Bong-gu and Hong Jong-hyeon is looks strong and charismatic with his sword in hand. Their diverse gestures and personalities may well excite anticipation among viewers. The photo shoot for the poster was held at the A Studio at the KBS annex in Yoido, Seoul, on Oct. 14. All the actors who participated in the shoot were at their best, making the atmosphere on the set warm-hearted. In particular Cha Tae-hyun, whose shoot time was twice long as the others’ due to his double character roles, contributed to making the atmosphere pleasant by making many jokes with other cast members and staff. As the drama was a genre of ‘magic action’, Cha Tae-hyun, Lee Hee-joon and Uee had to perform a scene of discharging ‘jangpung’ and performing Taoist magic. The cast practiced hard for their respective characters before the shoot.